The belief system of individuals increase when they read or learn about inspiring personalities who become achievers at such young ages, when a lot of them are still planning to reach their goals. Here is one such personality, who has inspired a lot of students of his age to dream and achieve.Read on! Meet Prathviraj Shetty, a third year student from University Visvesvaraya College of Engineering(UVCE), who believes that success should not be defined by who you are, but, by what you do. A silent-killer who doesn’t talk much, but acts upon what is needed and believes to achieve anything he dreams of. The confidence in him grew to this extent with the help of his mentors, who inspired him to have faith in what he does. He has been the reason today, for many youngsters to get the right direction, by helping them to connect to the right set of people through the right platform. He believes in the importance of platform because he had earlier been a part of a network-marketing company , where he believed he could connect to a lot of speakers and achievers, he could learn from. As days passed, he understood that he was no where led toward his dream to achieve and gain recognition from the society. He quit to continue, while he also started to search for a platform that could actually move him closer to his dreams. That was when, his mentor, Mr. Prashant Yag, Senior ambassador at i3, recommended him to be a part of the platform that has already changed the lives of lot of youngsters to work hard towards their dreams. When asked how a platform like i3, changed his perspective of life, with utmost confidence, he says, “Before sharing about how i3 changed my life, let me give you the definition of i3 which says it all. ‘i3-influence,inspire,impact’ is a tool which makes your life simpler and understandable. It is an equation to the path leading to success. It prepares you for the future that you always dreamt of, without compromising your present, making you more work-oriented and thus goal-oriented. It is a fluid which takes shape according to your dreams and the result is always proportional to your efforts. A place where you can expect the unexpected. It makes you well equipped for the war, you'll never get exhausted with the ammo!”. The definition itself is so inspiring that you could understand how deeply he is connected to the vision that helps dreamers, live their dreams. Coming back, Prathviraj understood the value of a platform because of his long journey before he was a part of it. As a child, he grew up in a small town Kundapur, where he resided with his mother and grandmother, while his father worked as a production manager at a private biscuit factory in Andhra Pradesh, India. His mother, who wanted to ensure that her kids get the best education, admitted him in an English medium school, against the opinions of the relatives. As he completed his 2nd grade, he was enrolled to join another school at the centre of the city, which was better than the previous one. The school was 13 kilometers away and they were informed that the school bus would pick him up at a stop which was 2.5 kilometers away. His mom took the strong decision to still admit him at the same school, learned how to ride a bike, bought one and would drop him every day to the stop where the school bus would pick him. This made Prathviraj realize that anything could be done if one has a strong determination to do it. Prathviraj continued to study in this school byhearting his school lessons. Byhearting was not his way of studying although it was advised by everyone. Finally, he was given a chance to join a school for his fifth grade, where the institute provided quality education, along with the all round development of the student. To join the institute, there was again a hurdle since he had to clear the entrance exams, for which a lot of preparations were required since the exam was considered to be hard to clear. His mother was once again there for him, when she took him to attend coaching classes which was far away from his residence. She would take him along, wait for upto 4 hours for him to complete his classes, take him back home. He was always inspired by such actions of his mother, which had made him realise how much his mother struggled to help him grow. He ended up clearing the examinations and got his admissions in the school too. That was the first ever time, he had to live far away from his family, at the residential school. He got adjusted to the environment and continued to pursue is education in the same school till his twelfth grade. By the way, he happened to score a CGPA of 9.8 out of 10 in his 10th grade which was a pride moment for him and his family. At the school, he was allowed to only connect to his family by writing letters to them, but, during his grade 7, the mode of communication was replaced by telephone. Prathviraj grew up with a lot of realisations, learning about the struggles of his family, for his education. He always had the feeling of making his family feel proud of him. Now, was the time, he had to decide the stream of education for higher studies. A friend of his, shared about one of the top colleges of the state, for which he applied and luckily, he got selected to join the college. Once again, he had to stay far away from his family, for his education. The environment was not new for Prathviraj, since he stayed in a residential school from his fifth grade, but, the opportunities around him was more in Bangalore, where he pursues engineering. He was introduced to the network marketing company, which did not lead him to the right path and finally, his mentor introduced him to the platform of i3, for which he shared with us, an inspiring definition. The time had come, when he decided to do all that it took to make his parents proud. He connected to a lot of young achievers through the platform, where he learned “To face challenges in life, staying with patience for the right time, being creative and tackling obstacles, saving money and being accountable, believing in oneself, also, reinforcing the power of women in the society” he says. Such lessons at an early age made him more mature and attain higher perspectives about life. He also got a chance to actually understand his society by directly connecting to them. Executing various projects like Taste from Waste which made him realize how one can utilize the waste around us to create something productive, meal donation campaigns where he understood about the other part of the society he had never seen, awareness campaigns where he addressed people about cyber crime, e4u project which made him realise the amount of e-waste that is harming the environment, more such projects got him to connect to people from varied backgrounds. 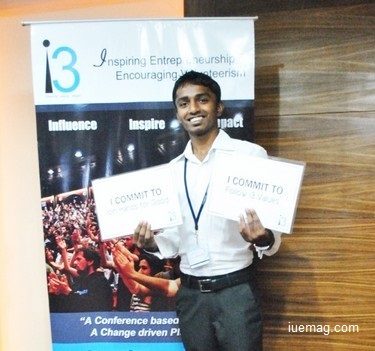 Prathviraj not only gave his best during his course of i3, but, continued to stay connected to his mentors for more opportunities and has currently been selected to be one of the very few ambassadors of i3, from across the country. He envisions to be an inspirational speaker, inspiring youngsters from across the globe, to do what they dream of. He has already been achieving his dream to make his family proud! Any facts, figures or references stated here are made by the author & don't reflect the endorsement of iU at all times unless otherwise drafted by official staff at iU. This article was first published here on 6th December 2015. To the Writer in YOU!